Thanksgiving is on Thursday and signifies the start of the holiday season. The beginning of a month or more of parties and indulgence. The average American gains 5-7 pounds in this month. Which means the average American has 5-7 more pounds to lose on January 1st. I tell people that the best way I’ve ever found to lose weight in January is to not gain it in December. It’s no doubt that the holiday season has proven to be a difficult time to lose weight but if you can find ways to keep your weight stable you’re 5-7 pounds ahead of the game in January. I’m not going to preach abstinence or deprivation as I’m certainly a fan of enjoying yourself during the holidays and don’t hold others to different standards than my own. What I can share is my philosophy and approach to holiday weight management. There are a number of ways but the most effective approach I’ve found for myself and others is to practice strategic indulgence. Certainly the quality of food and nutrient density goes down between Thanksgiving and New Years and the amount of sugar, wheat and alcohol go way up but I don’t think that in and of itself is the main problem. In my experience most people get in holiday trouble land when they either 1) eat foods they don’t normally eat (aka the above trifecta) 2) eat extra foods/treats in addition to the regular amount of food they normally eat 3) do one of the first two way often or 4) all of the above. If you’re not used to eating holiday type treats and then start eating them there’s a good chance your body will not be very prepared to deal with an onslaught of new, calorie heavy treats and you’ll store a bit of that extra energy as a result. Particularly when they’re thrown in on top of your regular meals, as your body is adjusted to run on the food it’s used to getting and may or may not be able to adjust its metabolism to make up for the extra massively concentrated calorie bombs and lighter fluid the holidays drop on it. End result: your body says thank you and your stomach/thighs/love handles get a nice layer of winter coating to keep you warm and insured for a cold winters day. How do you not gain weight during the holidays? Have a strategic approach to dealing with them. When you’re not “holidaying” eat whole, nutrient dense foods. The better you feed yourself at baseline the less likely you’ll overeat or make poor choices and the better state your body will be in to deal with the treats you do eat. Keeping yourself well hydrated with water and tea helps nicely this time of year. Choose a couple events to go big on, keep it mild on the others. Holiday indulgences usually come in two forms: solid or liquid. You’re less likely to get in trouble if you focus on one or the other, instead of both at one time. If you like both forms of “treats”, either go mild on both or pick one for one party and the other for a different situation. Eat the treats you like- don’t waste time, energy, guilt or calories on things you wouldn’t normally like or eat. Let holiday treats mean something and keep the everyday treats in their place. There’s no need to drown in nachos at a Christmas party and maybe the holidays can be a time to take a break from your daily mocha and muffin. There will be more treats around the house and office (and everywhere else) but keep an eye on just how much and often you’re surrounded by them. You’re only human and the more your willpower gets challenged the more likely it is to get worn down. Don’t put yourself in too many unnecessary treat laden situations. 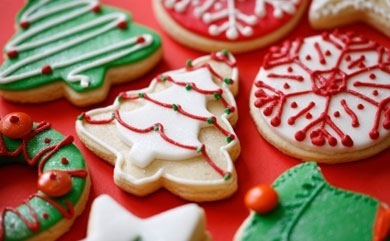 If you’re stressed and/or your mental energy (including willpower) is drained by life, it’s harder to manage any holiday plan, much less one that’s influenced by fudge and snowman sugar cookies. If you only have Thanksgiving, an office Christmas party and a New Years night out, you can pretty much disregard all this advice and go have as good of a time as you feel like having. If you have pies, candy canes, cookies and egg nog at your side on a daily basis and a party every other day in December, you’re going to need to think your holidays through and pay attention closely to the next month. My favorite tactic- skip out on something (or things) if I know there’s treats in my future. Cookies get eaten yes, but as a part of a meal, not on top of a meal. These are numerous ways to enjoy the holidays and weight gain but you’re the ultimate boss of your behavior. If you think that you’re going to be able to eat treats every day for 5-6 weeks and manage it with a trick or two, that’s your choice and I wish you luck. If you realize that some realistic balance and common sense is in order then you’re more likely to be able to both enjoy and survive the holiday season. No one is perfect, don’t let one day (or Peppermint Mocha Frappucino) get you down. Each day is a new day and offers you the opportunity to get back on track and learn from your experience. So enjoy the treats you want but keep your energy intake reasonable and close to what it normally is. Thanks for reading, have a great strategic holiday season! P.S. As an example, here is how I approach Thanksgiving: I start the day with a nice breakfast (e.g. eggs, bacon, fruit) and then I don’t eat until dinner. I love two things about this holiday: turkey and pumpkin pie. I eat a lot of both, love every bite, and fill the gaps with green beans, salad and water. I get everything I love about Thanksgiving and end up eating a lot less than the average person. For me it works well and I don’t have to worry one bit about eating too much pumpkin pie.